Viktor Belash (1893–1938) is a controversial figure in the history of anarchism in Ukraine. After heroic service as a military leader in the Makhnovist movement, he spent the last 14 years of his life on a mission to eradicate the last traces of the movement for which he had sacrificed so much. Belash was an anarcho-communist from 1908, a native of the town of Novospasovka, near the Sea of Azov, which contributed several notable commanders to the Makhnovist armed forces. As Makhno’s chief of staff for two years (1919–1921), Belash was widely regarded as equal or superior to the Batko in military talent, and was known for his efforts to introduce strict discipline into the ranks of the insurgent forces and eliminate drunkenness and looting. Kitaysky, a former chief-of-staff of the nationalist ataman Zabolotny, was soon shot, but Belash survived. He survived by writing a detailed account of the Makhnovist movement, an account which was not published in full until 1993. Belash’s bulky memoir, which covers the period 1919–1921, is often used by researchers without an understanding of the conditions under which it was written. Belash’s captors, the Ukrainian GPU, hoped to get their hands on Makhno and hold a public trial at which he would be smeared as a bloodthirsty bandit. Belash’s role was to provide material which would bolster this version of Makhno’s role in the Russian Revolution and Civil War. Makhno spent several years in prisons and concentration camps in Eastern Europe and only reached comparative safety when he escaped to France in 1925. Meanwhile, anarchists in Kharkov tried to help Belash by petitioning the GPU for his release in 1924. Surprisingly, the GPU was willing to oblige. Belash emerged from prison and was soon involved in organizing an underground conference of the “Nabat” Confederation of Anarchists of Ukraine, a conference to which former Makhnovists were also invited. But before the conference could convene, the GPU arrested 70 anarchists, including Belash. Most of those arrested were soon released, but six were sent into exile, three to the Narym region of Siberia, and three (including Belash) to the city of Tashkent in Central Asia. The following unique letter by Belash was written from Tashkent to Mark Mrachny in Berlin. Mrachny, a former leader of the “Nabat” Confederation who was also briefly active in the Makhnovist movement, was engaged in support work for anarchists imprisoned or exiled in the USSR. On February 4 I received your postcard, which mentioned sending me the Bulletin in the English language. Imagine that ever since I’ve been looking out the window for the postman with the Bulletin, but so far there’s no sign of it. Boris or Yefim received the Bulletin, and Izya (Shkolnikov) is working on translating it. It’s also strange that I haven’t received the two newspapers you send: “Rote Fahne” (with the supplement)… and “Golos Truzhennika” – this surprises me. The only publications I have received were two newspapers which came from America, sent by B. Yelensky: “Russky Golos” and “Novy Mir” – enough of that petty-bourgeois garbage. Concerning addresses for you, I spoke with Boris. As starosta, he knows a bit about the others, who are scattered around in different places: Krasnovodsk, Pishpek and Chimkent. He promised to send them to you right away; I told him for the fifth time to send you his own address, so that I don’t have to write to you about them. Today I received from Gavrilo (probably a pseudonym) a postcard postmarked with the date April 3. I’m very glad to learn that N. Makhno has to some degree gained his freedom. His old pals (Van’ka, Gurima) have long since settled down at home and are living, one assumes, not too badly. Levka and Danka are also living in freedom and have already gotten married. And I really don’t know why Volin hasn’t bothered to write so far. I’m working in an artel. The artel includes 17 Bulgarian families with up to 70 persons in total, half of them children; we’re on our own here, so we often have to fend off attacks from powerful outside forces. We have 49 desyatins of land on which cabbages, tomatoes and other market garden crops have already sprouted. We currently have three stalls at the bazaar, where we’re selling sorrel, radishes, cucumbers, onions. We’re thinking about setting up a “factory” and processing our own products. These Bulgarians are fine fellows, but they’re heavy drinkers. They’re inviting me to the Balkan valleys where, so they tell me, they drink red wine and listen to a symphony of gunfire in the mountains. (…) In the valleys hereabouts this is sometimes also heard. (…) I send my own friendly greetings to all, with wishes for health and success. Greetings from the boys. Note: as you see, Belash is not at all in need of material support. The other guys don’t get along with him. At the end of 1925 Belash was granted early release and returned to Kharkov, where he continued to be active not only as an informer, but also as a provocateur trying to push his old associates into suicidal projects. His activities were aimed at both the “Nabat” organization (urban anarchists) and former Makhnovists (peasant anarchists). It was only in 1934 that Belash announced that “Nabat” had finally been destroyed; the remnants of the Makhnovists were physically destroyed in 1937–1938. While exiled in Tashkent, I received a piddling amount of assistance from New York, from anarcho-syndicalists. I carried on a trifling correspondence with them, in particular with Mark Mrachny, who was in Berlin at the time. I received a postcard from Paris early in 1925. Its contents were roughly – “Happy New Year, Viktor, to you and the others”. The whole postcard was covered with names: VOLIN, ARSHINOV, NESTOR, GALINA, MRACHNY and a number of others. I don’t recall what sort of reply I may have sent to this postcard. Any responses would have been quite mundane in nature, since letters travelled by open post. Objecting to using the postal service was REVEKA (today in Kharkov). She was in favour of sending letters illegally through Kharkov to a secret address on the Polish border set up by Olga Taratuta. But objecting to this were DOLINSKY, LIPOVETSKY and myself. I objected because such correspondence could easily by-pass me. However, in spite of this, REVEKA was in contact with Warsaw directly, as I heard from Izya Shkol’nikov. This REVEKA stirred up suspicions against me, namely that I was a renegade. At that moment, in the autumn of 1924, there arrived in Tashkent from Moscow the anarcho-individualists Mark Nakhamkis (brother of Steklov), ­Nikolai and Izya Shkol’nikov. At the same time, the “Nabat” organization in Tashkent was arrested and awaited being shipped elsewhere. The active organizers of the Tashkent “Nabat” were Reveka, her friend from Moscow (I don’t recall his last name) who was working as an assistant to the editor-in-chief of the Tashkent newspaper, and a third Muscovite (who had already left Tashkent when we got there) who was a writer (I don’t remember his last name). They published a journal called “Nabat”, tried to publish a newspaper, carried on agitation against Soviet power and the NEP, and organized Italian strikes[17 ] – especially on the railroad and at the streetcar depot. After arriving, Shkol’nikov, Nakhamkis and Nikolai began to pester us to begin underground work by escaping from exile. Reveka had no particular problem with this, but Lipovetsky and Dolinsky categorically refused. The discussion dragged on for a whole month without getting anywhere. Then they left – first Nikolai, and 2 or 3 weeks later Nakhamkis. Skol’nikov stayed in Tashkent with us. After being in Tashkent for a year, I made contact with a veteran anarchist whose last name I don’t remember. Reveka was strongly opposed to him. However, he especially wanted to meet with me, which caused Reveka to regard me with suspicion. From this time (March–April 1925) she began actively to warn Lipovetsky, Dolinsky, their wives, and also the assistant editor of the Tashkent newspaper [about me]. From that moment, I got a hostile reaction from everyone. They still had dealings with me and engaged me in conversation, but were unwilling to maintain connections abroad through me, thanks to Reveka’s opposition. When I visited her apartment, she left me with her husband while she went outside and sulked. No explanations were given, and it was evident that my rehabilitation was not to be. To no avail. 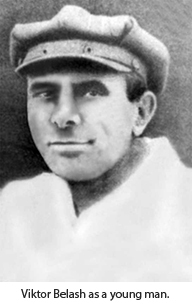 On December 30 1937 Belash was sentenced to be shot as a “counter-revolutionary”. His date of death is registered as January 24 1938, but apparently he was not shot so he may have died as a result of maltreatment in prison. He left a wife and two young sons with no means of support in accordance with Soviet law, since Belash had been branded an “enemy of the people”. This declaration was recently gleaned from the archives by Ukrainian researcher Yury Kravetz. A. V. Belash and V. F. Belash, Dorogi Nestora Makhno : istoricheskoe povestvovanie [The Odyssey of Nestor Makhno: an historical narrative], (Kiev, 1993). The Narym region was a huge, mosquito-ridden swamp in summer, while in winter temperatures dropped as low as -50° C. Its charms were well known to Stalin, who was exiled there himself in 1912. Tashkent, on the other hand, was a relatively modern city with a mild climate. From the Senya Flèchine Papers, folder 46, at the International Institute of Social History. Yefim O. Dolinsky (? – ?) Anarchist. Worker. Arrested in 1924, in June-August 1924 incarcerated in Taganka Prison (Moscow). In the same year he was exiled to Turkestan, where he was again arrested and incarcerated in the Verkhneural’sk political isolator. In 1929 he was exiled to Parabel (Narymsky district). In August 1932 was living in Belgrade. His subsequent fate is unknown. Isaak (Iza, Izya, Ilya) Abramovich Shkolnikov. Anarchist. A starosta in this context was a senior member of a group of political prisoners or exiles chosen to represent the group in dealings with the authorities. This was a tradition inherited from tsarist times. “Gavrilo” was in fact the pen name of Mark Mrachny. Lev Zinkovsky (Zadov) and his younger brother Daniil worked mainly in the kontrrazvedka (counter-intelligence) units of the Makhnovist army. In 1921 Lev was the head of Makhno’s personal body guard unit. Both brothers fled to Romania with Makhno in August 1921, but returned to the USSR illegally in 1924 and surrendered voluntarily to the OGPU (secret police). Revekka Yakovlevna Yaroshevskaya (1887–?). Anarcho-communist. Possibly a reference to the Basmachi movement, a popular revolt against Soviet power was persisted as a guerilla movement in the mountains of Turkestan even after the movement had been destroyed as a military and political force. L. D. Yarutsky, Makhno i makhnovtsy [Makhno and the Makhnovists], (Mariupol, 1995). Lev Yarutsky, a local historian living in the city of Mariupol near Belash’s home town, published Belash’s “confession” as an appendix to a volume of essays about the Makhnovists. This document seems scarcely known in the West, and generally one finds no mention of Belash’s misdeeds in books and articles published in English. 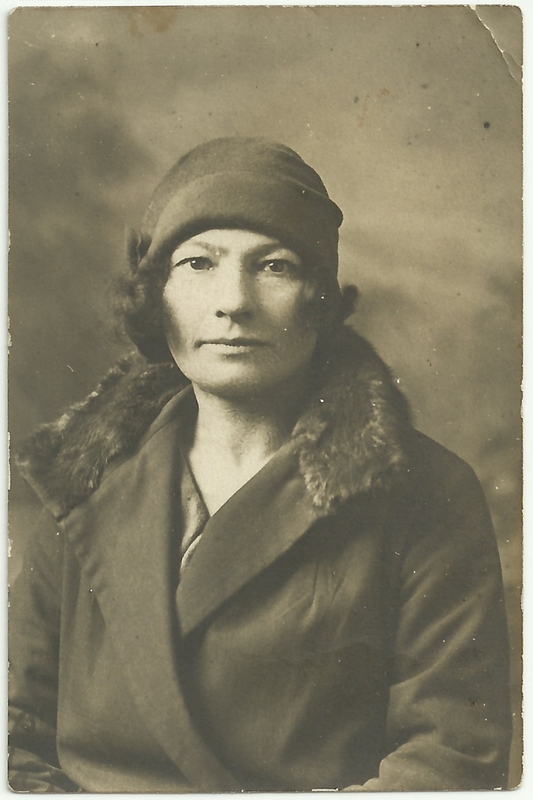 In 1924 Olga Taratuta (1876–1938), the legendary “grandmother” of Ukrainian and Russian anarchism, set up an illegal “corridor” near the city of Rovno, used for smuggling literature – and people – across the Soviet-Polish border. Yury Steklov (1873–1941), whose original name was Ovshy Nakhamkis, was a Bolshevik historian-activist who wrote numerous scholarly books and articles on anarchist themes. Lipovetsky and Dolinsky were Belash’s fellow-exiles from Kharkov. 1. I. Teper, Makhno: from “united anarchism” to the feet of the Rumanian king, (Kharkov, 1924). 2. L. Yarutsky, Makhno and the Makhnovists, (Mariupol, 1996). 3. The Peoples of Southern Priazov’ye, (Mariupol, 1996). 4. P. Lavriv, The Colonization of the Ukrainian and Contiguous Steppes, (Melitopol, 1997). 5. N. Makhno, The Ukrainian Revolution (July – December 1918), (Paris, 1937). 6. M. T. Davidov, “Among the Partisans,” in Zvesda, 1959, no. 2. 7. The Civil War in Ukraine 1918-1920: Collection of Documents and Materials, in 3 Volumes, 4 Books; Vol. 1, Bk. 2, (Kiev, 1967). 8. A. V. Belash and V. F. Belash, The Roads of Nestor Makhno, (Kiev, 1993). 9. Nestor Makhno, The Peasant Movement in Ukraine. 1918-1921: Documents and Materials, (Moscow, 2006). 10. RDVA. F.936. – Op.1. – Spr. 4. 11. TsDAVOVU. F.1. – Op.1. – Spr. 17. 13. RDVA. F.936. – Op.1. – Spr. 12. 14. A. Bek, “Such were the duties…” (Recollections of Dibets) in Collected Works, (Moscow, 1989). 15. Free Kuban (Yekaterinoslav). – 1919. 16. RDVA. F.199. – Op.3 – Spr. 186. 17. RDVA. F.199 – Op.2 – Spr. 156. 18. “Diary of the Chief of the Makhnovist Intelligence Service L. Golik” in Nestor Ivanovich Makhno. Memoirs, Materials, Documents, (Kiev, 1991), pp. 167-171. 19. TsDAVOVU. F.2. – Op.1. – Spr. 689. 20. 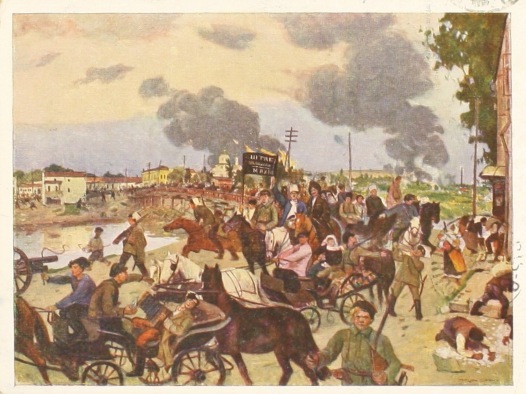 P. Arshinov, History of the Makhnovist Movement (1918-1921), (Zaporozhia, 1995). 21. A. A. Delieva, “1848 – 1998, 150 Years of the Delieva Family” in Sources of the History of Southern Ukraine, Vol. 9. Memoirs and Diaries. Ch.2, (Zaporozhia, 2006). Taken from the minutes of the Extraordinary assembly of militians, Barcelona, March 1937, as reprinted in The Story of the Iron Column: Militant Anarchism in the Spanish Civil War by Abel Paz. Which has just been copublished by AK Press and the Kate Sharpley Library. This is also the story of an émigré community whose members invented an anarchist bogeyman to justify having betrayed their pacifist principles. It’s about estate owners who earned 3000 times what they paid their labourers, landlords who conscripted soldiers to protect their wealth, and pacifists who fought for an army that killed tens of thousands of Jews. It’s not strictly relevant to Bolshevik repression of anarchists, but well worth reading.